Alan Irvine has been appointed West Bromwich Albion manager. Irvine, 55, the academy manager at Everton, has agreed a 12-month rolling contract at The Hawthorns. Former Tottenham manager Tim Sherwood had been favourite for the role following Pepe Mel's departure in May. "We firmly believe we have the right coaching team to move the club forward. In the end it came down to two outstanding candidates," Albion technical director Terry Burton said. "But, following a detailed recruitment process, we decided Alan and the team around him are best suited to tackle the challenges we face in the Premier League." Sherwood, 45, was expected to be given the West Brom job, but BBC Sport's Midlands correspondent Pat Murphy said he was unhappy with the terms offered to his intended backroom team of Chris Ramsey and Les Ferdinand. Burton said the club had targeted candidates "renowned for their coaching ability". He added: "Alan was very much at the forefront of our thoughts because of his achievements in the Premier League and the high regard he is held in within the game. "He has a vast knowledge from grassroots up thanks to the roles he has performed during his decades in the game and knows what it takes through good and testing times." Irvine brings with him Rob Kelly to work as joint assistant head coach alongside Keith Downing, while Dean Kiely remains as goalkeeping coach. 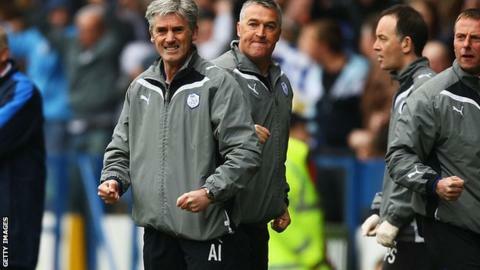 He previously managed Preston North End, from November 2007 to December 2009, and Sheffield Wednesday, from January 2010 to February 2011. Irvine turned down an approach from West Brom in June 2009 when he was still in charge at Preston. He held academy roles at Newcastle United and Blackburn Rovers between 1992 and 2002. West Brom finished the 2013-14 season in 17th, just three points above the relegation zone. Mel was their second head coach of the season, with Steve Clarke departing in December after four successive defeats. 1992: Moves into coaching after a playing career which included spells at Queen's Park, Everton, Crystal Palace, Dundee United and Blackburn. Works as Academy director at Blackburn and Newcastle. 2002: Returns to Everton as assistant manager to David Moyes. 2007: Appointed Preston manager and leads them to Championship play-offs in 2009 but is sacked at the end of that year after a run of just one win in 10 games. 2010: Becomes Sheffield Wednesday manager and wins first three games but can't prevent relegation from Championship after a downturn in results and is sacked the following February. He joins Everton as academy manager in May 2011. 2014: Appointed West Brom head coach.